DON'T WAIT 30-60 DAYS TO GET PAID. GET CASH WITHIN 24 HOURS! We pay cash for your slow paying freight bills. Having to wait 30 to 60 days to get paid for your freight bills can be very difficult. If you are working with reputable clients and freight brokers, we can help you get paid quickly, usually in 24 hours. We work with trucking companies and freight brokers in the USA and in Canada. What Can Freight Bill Factoring Do for You? Our freight bill factoring financing program allows you to turn your slow paying freight bills into immediate cash - eliminating the wait. We provide you with the money to make critical payments to drivers and suppliers, while we wait to get paid by your customer. 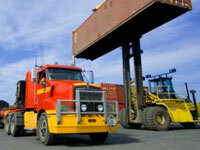 Freight factoring is very easy to qualify for, quick to set up and inexpensive to use. How Does Freight Bill Factoring Work? Once the freight bill is paid, then we rebate the remaining reserves, less our fee. Monthly fees are very affordable and range between 1.5% to 5%. Copyright © 2007 by HGS FINANCIAL GROUP, INC. All Rights Reserved.